Hi, yet another trick for airtel android users. Now you can enjoy free 3g internet on your airtel sim with android phone. You need only to download an application called droid VPN. here I have described the full procedure to setup free airtel 3g internet trick on droid vpn app [ android app]. So guys read the steps and start enjoying free 3g internet on your android device with airtel sim. I know that the 2g,3g,and 4g internet data plans are very costly nowadays and it is not possible to buy a good internet data plan below Rs 100 in India today. But don’t worry guys, techintor.com here for help you. We have lots of free internet tricks for all indian networks. Of course, In this article you will get airtel free internet trick for android device. If you are a android device owner and looking for getting free 3g internet on your android phone with airtel sim then you should read this article. there are lot of useful info added for you. In this article you will get airtel android droid vpn free internet tricks. This article contains airtel free internet using udp protocol / tcp protocol /icmp protocol. UDP Protocols are working based on the open udp ports. The TCP Protocol trick are working based on Open TCP Ports and airtel free hosts. guys there are many other free internet tricks also working for android better than this trick. We given a Note for ‘airtel free internet trick for android’ below. We recommend you to try all tricks. Since some tricks get blocked in some states for sometime. So it will be useful trying all tricks and finding a high-speed free internet trick for your state by your own’ . So guys don’t miss the note given below [links for appropriate tricks given there, you can click there]. A last word from us, First read this article completely and try ‘airtel free internet with droid vpn on your android device‘ if you failed to get free internet on your android with this droid vpn trick then try all tricks that i mentioned in below note. Requirements before proceeding to this airtel free internet tricks. Maintain your airtel prepaid account balance and data balance zero. [ to avoid balance deduction this is must]. You should registered to airtel 3g network. [there should 3g access on your airtel sim]. If your airtel sim not registering to 3g network at zero balance. then first follow this article -airtel 3g zero rental pack trick and activate airtel 3g zero rental pack. then you can manually register to airtel 3g network. >> If you are new to Droid VPN , then you need to register an account at DROID VPN website- click here [free account]. >> after that goto droid vpn settings>>configure account>> then enter username and password there. 2. Now if your phone pop ups any warning messages that ‘ trust this application ? ‘ just allow it and continue to the application . 3. 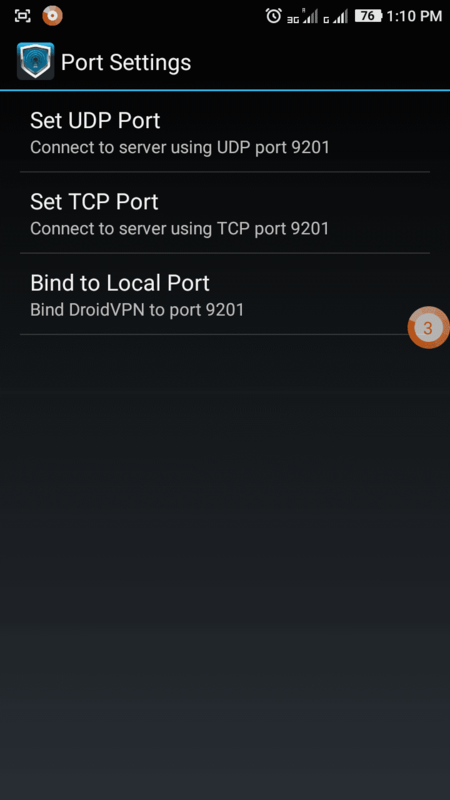 Now Go to Settings on Droid VPN then click on ‘Connection protocol‘ >> then select ‘UDP‘ there. 4. Now click on ‘port settings‘>> then enter ‘9201‘ on all columns [ enter 9201 on UDP Port, TCP port and on local port]. 4. Now go back to droid vpn start screen and select any free server there. Now tap on the big connect button. that’s it. You will be connected within seconds. after successful connection you can start enjoying free internet on your android device with airtel sim. Here is the ultimate video on how to configure droid vpn app to get free internet on airtel sim. watch the step by step video below. please subscribe to our youtube channel and support us. Note: Before proceeding to the trick, make sure that your airtel sim have 3g access. that is you need 3g access on your airtel sim at even zero balance [without any datapack]. if you are not getting 3g signals at zero balance then follow our airtel3g zero rental pack trick. P.S: If one.aritel.in host not working, try with below host settings also. 1. 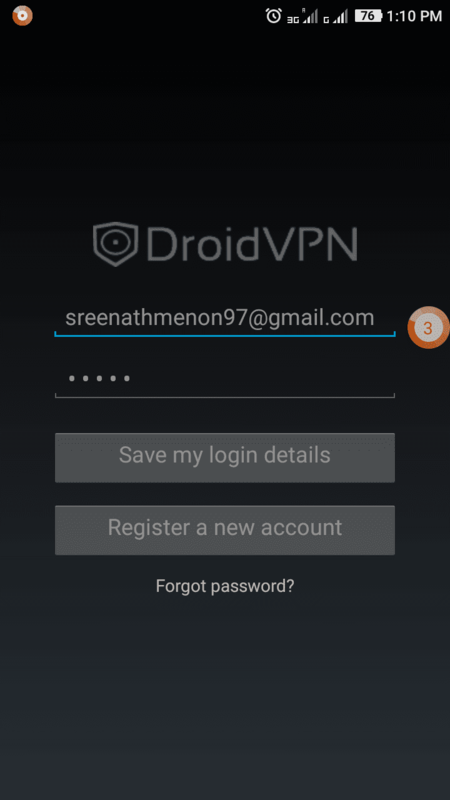 Download Droid VPN app and Login with your user name and password [ download from playstore]. 4. Then go to Port settings>>Set TCP port and enter 443 there. If the above settings in droid vpn is not working try below settings. I hope that you are happy with our services. Share our posts and support us. check this new trick [trick no.1]airtel free internet trick using droid vpn with UDP Protocol. >> getting very good speed. Not working in west bengal . Sows server connection time out. No server reply. Send my email that how can I solve it. not working in punjab ..
how I unblocked my airtel sim card in westbangal now . Comment:mine also same problem yar. my vpn get disconnected every 50 seconds why? It works! Wow! Thanks a ton! I just can’t believe this! Let’s see how much it’s effective. Just as extra information since I am loyal user of CashKaro. I always check http://cashkaro.com/stores/airtel-online-recharge this to find the best cashback offers to reduce my bill. Awesome, right? Working in Punjab use local port 3128. Airtel 4G almost come in all state. So please post airtel 4G trick with droid vpn. This airtel 3G trick with droid vpn is working but very slow speed. Therefore please airtel 4G trick with droid vpn post it quickly. i think already a airtel 4g internet trick is published. I only follow you. I did not understand any website trick like opera mini handler. You suggest me to use opera mini handler trick but i did not from any website. So please you publish airtel 4g trick. Your previous trick airtel 3g work but very slow speed. 1. Open TroidVPN. Select Any Free Server. Set TCPPort. 4. Go to Advance Settings. 10.Save Go back & Press Connect. I can connect but the speed is 2-3 kb/s. I'm from Haryana. plz send me write setting of droid vpn…..
Hey gys m using this trck wth droid vpn n my totl speed in dwnlodng utb vdeo is 2 mbps in hryana in frdbd. Its depnds on your sim netwrk try to use server 6, 5, 4,&3. This is awsom servers. Bro, How much data can i use on airtel. Between is it legal??! is it work on hammer vpn? help me ..mera droid vpn connect nehi horehi he.mera state west bengal ha. pls pls pls pls pls help me..
please ensure that you are done all settings correct. and try with different servers. This tricks working Airtel up east circle. Hey.. The last time I made some mistakes so again…. Droidvpn worked fine earlier when my balance was ₹15. It stopped working for no reason one day.. Error "no Internet connection detected".. This trick is supposed to work at zero balance and my balance at that time was zero..
Now u recharged my phone and droidvpn for connected too but it is just using my main balance and not giving any free net.. Can u help? Brother jab tak mere sim me mb data hota a tab tak to Droid vpn connected rhta hai but jese hi mb finish hoti hai or data ek bar band ho k fir se on hota hai to droid vpn connect nahi hota tab bar bar ik error ata hai k – Http/TCP connection is timeout…. Please check your internet connection…!!! bhai data pack se contact hoga kya???? all tricks are not working in my phone . i am from jharkhand. 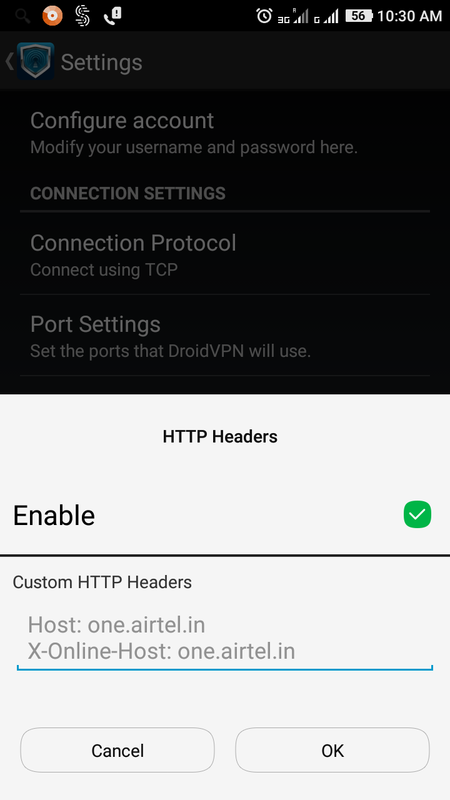 added one new trick on this article: airtel free internet trick using droid vpn with UDP Protocol. check this [trick no.1]airtel free internet trick using droid vpn with UDP Protocol. hello bro, my name is saurabh i have tried many tricks of vpn but not working anyone for me plzz help me to enjoy free internet. i m from m.p. and i m using moto g2nd gen plzz plzzzzzz help me. Friends updated with new trick using droid vpn udp port. brother trick no.1 -using udp protocol , working fine all over India. personally tested in kerala today. check the video [verified 24/10/2016, you can see it from video]. plz follow all steps carefully. also read the requirements to work the trick. Not working in West Bengal. What should I do sir?? Droid vpn is updated. Menu is changed in new version, tell latest trick for latest droid vpn. Droid vpn is updated. Menu is changed in new version, plz tell latest trick for latest droid vpn. Not working in west bengal. Sows server connection time out. No server reply. Send my email that how can I solve it.